I love Disney movies and I’m so looking forward to sharing them with the boys. My favorite Disney movies are Up, Lion King, Aladdin, Wall-E, Beauty and the Beast and the Princess and the Frog. I love the Pixars as much as Original Disney movies. But I’m not introducing these to Oli & Milo first. I’m going to introduce the sweet and gentle movies first. Mom Bloggers everywhere swear by Common Sense Media and you should too. Winnie the Pooh (2011) – Adorable big-screen Pooh adaptation is short and sweet. “Parents need to know that this big-screen take on Winnie the Pooh is as sweet and gentle as the original Disney cartoons, making it accessible for even the youngest movie-goers (and a fine pick for little ones’ first movie). Preschoolers and early elementary-aged children may not understand the way the narrator speaks to the characters (who also interact with the letters and words on the screen), but it won’t get in the way of their enjoyment. The sequence in which the mysterious “Backson” monster is described could mildly frighten some tots, but otherwise this is a faithful adaptation of A.A. Milne’s classic tales.” From Common Sense Media. Fun Fact – In 1961, Walt Disney also purchased the motion picture rights from A.A. Milne’s widow, Daphne, and so began a brand that continues to thrive for his company. A series of Winnie the Pooh shorts were released in theaters starting in the late 1960s. In 1977, a trio of these made up Pooh’s first theatrical release The Many Adventures of Winnie the Pooh. The 1980s brought two television shows, Welcome to Pooh Corner and The New Adventures of Winnie The Pooh. Then the 2000s offered The Tigger Movie, Piglet’s Big Movie, Pooh’s Heffalump Movie and the CGI series My Friends Tigger & Pooh. 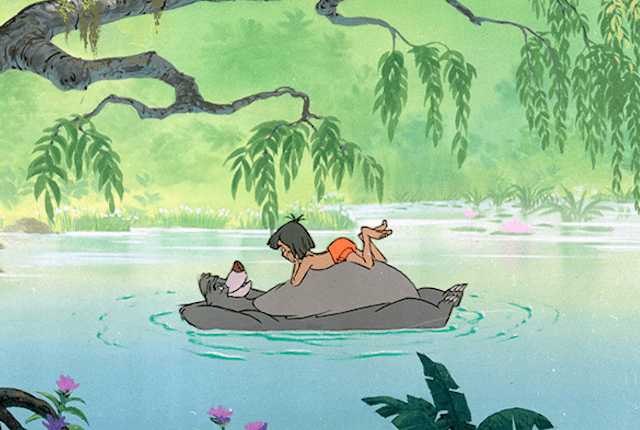 The Jungle Book – Animated (1967) Jaunty animation meets jazzy songs in Disney classic. “Parents need to know that The Jungle Book is a Disney classic with positive messages for kids about friendship and finding family in unexpected places. There are some scary and/or upsetting scenes, such as the final battle between Baloo (a bear) and Shere Khan (a tiger), but there’s also lots of humor and catchy songs.” From Common Sense Media. Fun Fact – The Sherman brothers wrote the vultures’ song “That’s What Friends Are For” with The Beatles in mind, even giving the characters similar accents. But the Fab Four turned them down. “John was running the show at the time, and he said [dismissively] ‘I don’t wanna do an animated film.’ Three years later they did Yellow Submarine, so you can see how things change,” Richard Sherman said. Alice in Wonderland (Two-Disc Special Un-Anniversary Edition) Surreal animated Disney classic with mild peril. “Parents need to know that Disney’s classic animated interpretation of Lewis Carroll’s tale Alice in Wonderland is a great “starter” Alice for younger kids before moving on to more mature and theatrical versions, like Tim Burton’s trippy 2010 adventure. Disney’s 7-year-old Alice embarks on a colorful journey that does include some mild violence (especially when she meets the sadistic Queen of Hearts) and taunting language like “stupidest” and “fat.” Three animal characters smoke either a pipe or, in the case of the caterpillar, a hookah.” From Common Sense Media. Pinocchio, The Lion King, and the Beauty and the Beast are darker than you remember. Common Sense Media is a great resource for moms and dads looking for quality movies for their children.